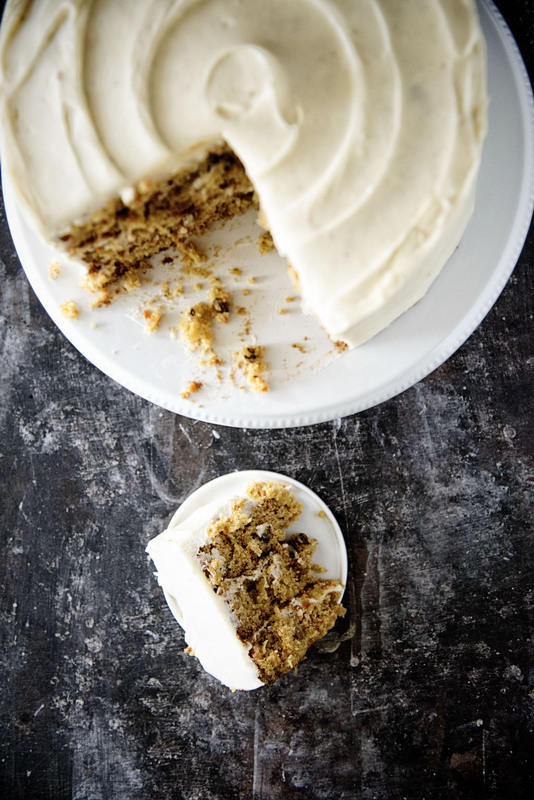 Chai Spice Brown Butter Carrot Cake: The addition of chia spice adds and extra kick to this classic carrot cake recipe topped with brown butter cream cheese frosting. My mother raised me that if 10 people were coming to your party then cook for 100. So whenever I have people over for a meal I tend to go a little crazy. My friend and her fiance were over this past weekend. I offered to make some food and she was like oh don’t go to the trouble. Promptly reminded her that I like to cook and bake so it wasn’t an issue at all. She said okay but maybe just dessert. I asked her what her favorites were. Carrot cake. Cheesecake. Apple crisp. So I made carrot cake…this one. I made cheesecake (recipe will be on the blog soon). And a variation of this pie. Also made this soup and some quick pasta. Kind of overwhelmed her with my dessert buffet for four people but she loved it. 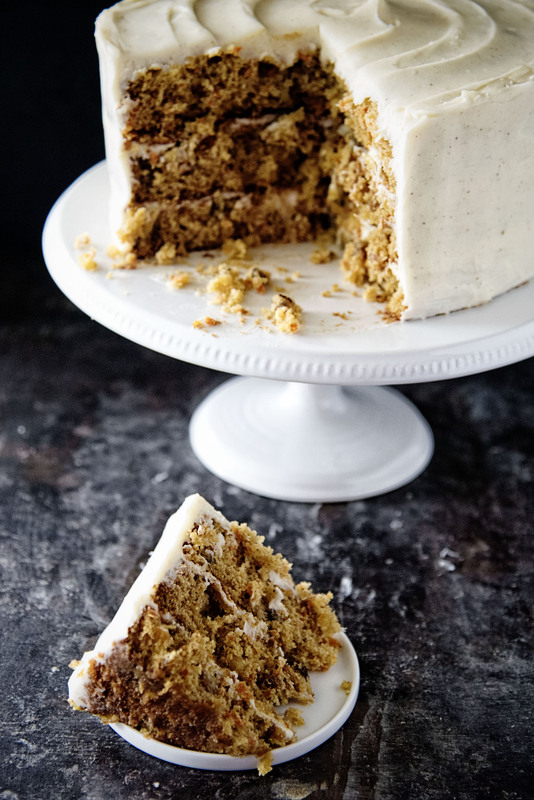 This carrot cake is basically a classic carrot cake but with the addition of chai spice which adds a nice dimension to the cake. 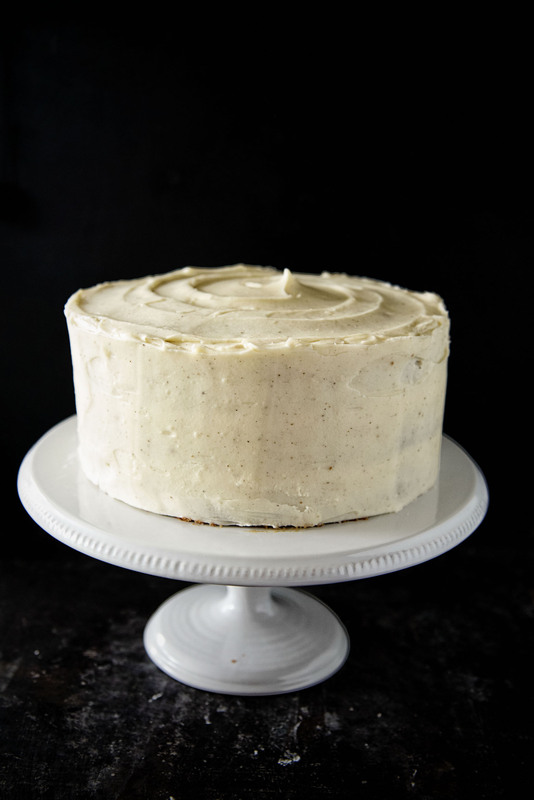 The brown butter makes the cream cheese frosting even that much better. Just make sure you brown it and get it cool enough by placing it in the fridge for a bit before using it to make frosting. Preheat oven to 350°F. Spray 3 (9-inch) round cake pans with baking spray with flour. Line bottom of pans with parchment paper, and spray pans again. In a large bowl, stir together flour, sugar, raisins, walnuts, cinnamon, baking soda, baking powder, salt, and chai spice . Add carrot, pineapple, eggs, oil, and vanilla, stirring until well combined. Divide batter among prepared pans. Bake until a wooden pick inserted in center comes out clean, about 25 minutes. In a large bowl, beat cream cheese and browned butter with a mixer at medium speed until smooth. Gradually add powdered sugar, beating until creamy, 4 to 5 minutes. What kind of chai spice did you use? I like the King Arthur Flour Blend.